Ever wondered why we compete in a particular game, what is it that keeps players fight it out till the last breathe? Looking at the players of ICL battle it out at the Tau Devi Lal Stadium, one can't help but think along this line, and then we look at the fiery thing placed at a podium, we know this has to be it. A sparkling, dazzling, inspiring trophy that waits to be taken away by the best man and the best player. What intrigues is the story behind the trophy and who else can satiate our curiosity other than the makers? We spoke to Ricky Sharma of Loka Lifetsyle and one of the keyperson behind the conceptualisation and creation of the ICL trophy. "One thing led to the other," says Ricky, who is not sure whether there is a 'story' behind this trophy. "We were given the job of creating the trophies for winners and the Man of the Match and we have delivered it." We ask him to break the modesty for a minute and elaborate. "Okay. Here it goes. We were given the basic outline and we had to work on that. Sometimes, the idea comes in a flash, but most of the times you have to rack your brains." Adds Ricky, "The idea then goes through various stages of execution, starting with conceptualisation, application, production, design, fine tuning till we have the final product. This is not all that simple as it reads." Trophies, like these ones, are not made in a day. He smiles, "Sometimes, the design doesn't take the right shape in the production stage. Then you have to make some last minute changes. For instance, for the Man of the Match trophy, we tried various metals that would give us the desired shape, and finally we had to settle with copper, as it more stretchable and can take up the desired shape. So, there is a lot of experimentation is this as well." So, that's how you get a rewarding trophy, of course you have to fight for it for sure. The ICL winner's trophy is 18 inches in height and weighs five and a half kilogram. It has a huge crystal in the middle and the four diodes behind it lend a sparkling affect. "About 15, 000 crystals have been used in the trophy, which depicts the fire of ICL, which is also the theme." Coming to designing a trophy, it takes much more than just an idea? "As I mentioned before, one thing leads to another," offers Ricky, who has also done the trophy for ICC awards, the Champions trophy (except for the winners trophy) and all the trophies for Hero Honda Indian Open (except for the winners). "One, we need to know bout the event, any main sponsorors or associations and sometimes, we have to change the whole thing according to the stakeholders," he adds. And in the end you get the reward - the trophy. Smiles Ricky, "To me a trophy is much more than a souvenir that you place in the drawing room. It is a reward and that a team or an individual wins after fighting it out at the battlefield. It says that you are noticed and makes you feel proud." So, you have checked out Fashion, strolling at FR is no good. Well, then there is one place where you can hang out. Tau Devi Lal Stadium in Panchkula, where all the cricketing action is happening. 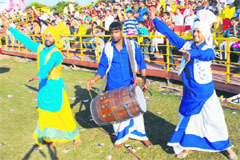 The lazy Sunday afternoon saw spectators cheering, dancing and hooting. And so whoever said Indians have all the time in the world, said it right. The crowd validates it. Lagey raho India! Do Punjabis need a reason to dance? Certainly not! Wedding functions, birthday parties, movie shoots, or cricket matches, they can bhangra pao everywhere. 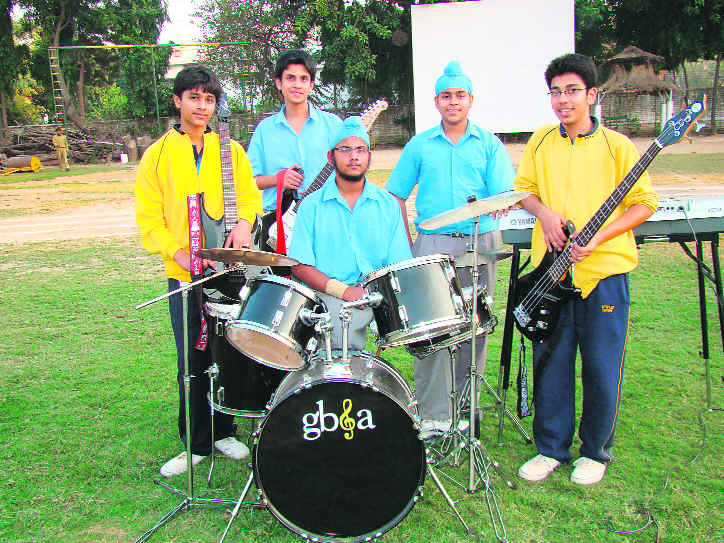 So, each time a cricketer hit a six or four, the bhangra boys dressed in white chadra and blue kurta knew what to do. Oh, balley balley, chak dey phattey! Asking a policeman to work is a sin, and posting him at a cricket stadium….don't ask! Parked in front of the mediacentre, we heard two cops sharing notes in Haryanavi. "Yeh log baawarey hain kya, Sunday ko bhi match dekhan waavain. Chalo apni to duty hai, inka dimaag ghaas charan gaya key." Who says hard work remains unnoticed? It may take time to make people sit up and notice your talent, but it does happen one fine day. And when it does, nothing is the same again. Sharing this story who have finally found a space under the sky, is Labh Janjua, the Punjabi singer from Khanna. He got the whole world dancing to the hit number —Ni tu huney huney hoye mutiyaar, mundaiyaan to bach key rahin. And, if you are thinking this one hit brought the whole world under his feet, then this is what the singer has to say. "I moved to Mumbai three years back hoping that I would get work easily given the hit that I gave. But, Bollywood is very different place. I had to struggle for three months, meeting various music directors, producers and introducing as the one who gave the song Huney Huney for Bollywood flick Boom." After all the struggle, he finally met music director Pritam who offered him Chori Chori for Garam Masala. And as we always say, Labh never looked back. "I got good work, great songs, which told what kind of singer I was, says Labh, who gave super-hit numbers like Paapey pyar karkey (Pyar Key Side Effects), Yaara dol bajakey (Dhol), Soney dey nakhrey (Partner), Aag legey aaj kal dey fashion nu (Haal-e-Dil) and the rocking chartbuster Ji karda (Singh is Kinng). Well, it is never too late. What say Labh? "It took seven years of hard work, dedication to reach where I am today. Bollywood is not a very dariya dil industry. Here, you have to prove your worth, and I am glad that I could do it. Also, if you think you can ride on a single hit song, forget it, people will forget you in a day. You are required to deliver good work each day to stay alive in their hearts." Now that he has arrived, does he wish to look back and thank someone? "God," comes the reply. "He has been there with me always," says Labh, who doesn't find any competition with other fleet of Punjabi singers. "Mika, Daler Mehndi have few hits, whereas I have 56 films to my credit. I have no competition from any of them." At the same time, Labh heartily wishes that Nusrat Fateh Ali Khan was alive. "He was a fabulous singer." What about the present lot of singers, any favourites? "Sukhwinder is a good friend and a great singer as well." Coming back to what he is best known for, his Punjabi Hindi touch songs, we ask him if that is his signature style? "I can sing all kinds of songs, chaste Hindi and Punjabi both. This is my style," offers the singer, who wants to sing a song for Amitabh Bachchan. "That too will happen bahut jald," he says. The singer also works closely for Aadhar, a welfare organisation engaged for providing free education to needy children and free ration distribution to poor families. There isn't any wholesome super food that provides the body with all the nutrition. Instead, we have to nourish our body with a balanced diet to keep us in good health. Amazingly nature gives us some clues. Many fruits and vegetables are colour coded to help identify the types of nutrients found within. The colours are actually pigments that come from a special class of chemicals known as phytonutrients. They also known as phytochemicals, the natural plant compounds that can help protect against cancer, diabetes, obesity, heart disease and age-related cognitive and physical decline. When you eat foods of a particular colour, you access their particular healing power and fruits and vegetables can be grouped into seven colour categories: Strive to get at least five colors on your plate. Foods in this group contain the caretenoid lycopene, which helps the body to rid itself of free radicals that damage genes. Lycopene protects against breast and prostate cancers as well as heart and lung disease. We need to eat fruits and vegetables such as tomatoes, watermelon, red apples, blood oranges, cherries, cranberries, red grapes, pink and red grapefruit, red pears, pomegranates, raspberries, strawberries, beets, red peppers, radishes, red onions to get these benefits. This combination of green and yellow foods contains the carotenoids lutein and zeaxanthin that help reduce the risk of developing cataracts and macular degeneration. These foods are also helpful in reducing the risk of osteoporosis. You need to eat foods such as avocado, collard greens, mustard greens, spinach, yellow corn and honeydew melon. The orange foods have carotenoids that help prevent cancer by repairing the DNA. Carrots and other orange foods are especially good for our eyes, help with night vision and protects the skin against free-radical damage The deep orange foods help our bodies in intake of Vitamin A. So eat up your carrots as well as mangoes, apricots, cantaloupe, pumpkin and sweet potatoes. These foods that are orange and yellow in color are high in antioxidants, especially Vitamin C and help to improve the health of the mucus membranes and connective tissue. They help prevent heart diseases by improving circulation and preventing inflammation. Eat pineapple, oranges, tangerines, peaches, papayas and nectarines to receive these benefits. This group of foods contains anthocyanins - powerful antioxidants to improve brain function and may delay the ageing of cells in the body. They are also believed to protect against heart disease by preventing blood clots. Eat beets, blueberries, blackberries, purple grapes, eggplant, cranberries, apples and strawberries. You can even include a glass of red wine. The sulforaphane, isocyanate, indoles and folic acids present in this group ward off cancer by inhibiting carcinogens in the body, helps DNA repair enzymes and help to regulate genetic switches. Green foods are also good for the circulatory system and contain minerals and B-complex vitamins. Broccoli, green apples, green grapes, kiwifruit, lime, green pears, asparagus, Chinese cabbage, beans, green cabbage, celery, cucumber, lettuce, green onions, peas, spinach and zucchini come in this group. Onions, garlic, celery, pears, chives and leeks comprise this group. White and green combination foods contain a variety of phytochemicals. If you are looking for a healthful diet packed with colorful fruits and vegetables, don't forget nuts. Nuts contain antioxidants that help prevent heart diseases. They also provide fiber and high quality protein without the fat. Go for walnuts, almonds, Brazil nuts, cashews, pistachios and peanuts. It's an irony of sorts, where an exhibition called the 'The Himachali Exhibition', has nothing but only one Himachali goods stall and rest from Bihar, Jaipur, Ambala and Kashmir. On display at Lajpat Rai Bhawan-15, the exhibition showcases shawls, stoles, jackets, bedcovers, quilts, fabric and footwear. Half a round and the exhibition draws to a close that starts with the one and only stall of Himachali goods. Displayed here is sheep and yak wool and pashmina shawls besides stoles, coats, jackets and sheep wool socks. 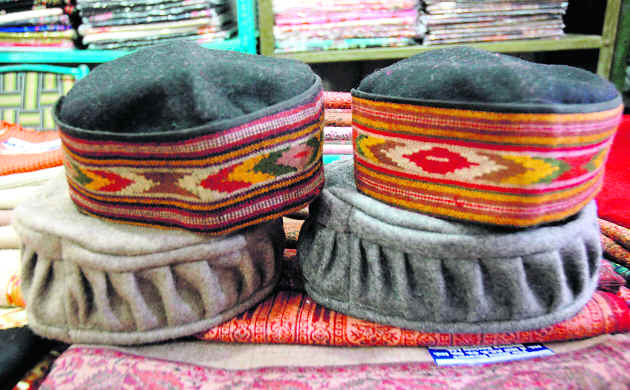 In vibrant hues and traditional boarders these things come from the Manu Weavers Welfare Society, Manali. In city for the second time the exhibiter from the manu weaver's welfare society says, "The response for Himachali goods is always great. And with winters almost here, we have showcased traditional Kullu socks that come in ethnic designs, shawls with traditional patterns and stoles in rainbow hues. Apart from this, we have the sheep wool jackets that come embedded with Kullu boarder and long coats." The sheep, yak and pashmina wool shawls start from Rs 1200 to Rs 20,000, stoles are priced at Rs 1000, jackets are for Rs 500, long coats are priced at Rs 1500 and socks are priced at Rs 120 a pair. 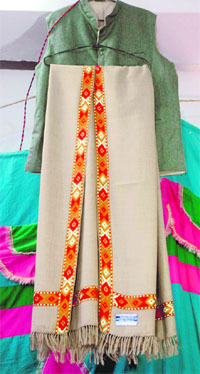 Next comes the evergreen cotton kurtis and Jaipuri and bamboo chappals that we seei all round the year. They are priced at Rs 300 and Rs 350 and Rs 150 respectivley. For home décor, there are bedcovers, blankets, Jaipuri and fibre quilts. Starting at Rs 450 the price range of bedcovers goes up to Rs 2500 and quilts and blankets start at Rs 1000. Last of all, there is this stall from Kashmir that showcases shawls, stoles, jackets and suits. In intricate Kashmiri embroidery and brilliant hues, the price range of these good starts at Rs 350 and goes up depending on the products you buy. Though the exhibition isn't impressive at all, but the variety of Himachali shawls is the only saving grace. Not everyday you meet someone who makes you stop and give a good look. And not everyday you meet someone, whom you want to write about, willingly. And not everyday you meet people oblivious about their own popularity. So, when we met up with Usha Sharma, the first lady to act in Haryanvi cinema, you certainly couldn't help but wonder. Haryanvi cinema, we've never heard of something like this! No offense meant, but most people wouldn't have. Smiles Usha. Looks at us and says, "It was way back in 1983. How old were you then? We got the answer, but Usha is not someone who wants to prove a point. "Not a big deal. I can tell you about it. I was the first lady to act in a Haryanvi cinema, but this is not what I had intended for myself." Usha, who is presently the director of Haryana Kala Parishad, takes us back to her village, where Pandit Jawahar Lal Nehru had paid a visit. "I was in the fifth grade, when I danced on stage. Panditji liked the dance so much that he picked me in his lap, which made me think that a choti si performance could fetch me warmth and adulation. 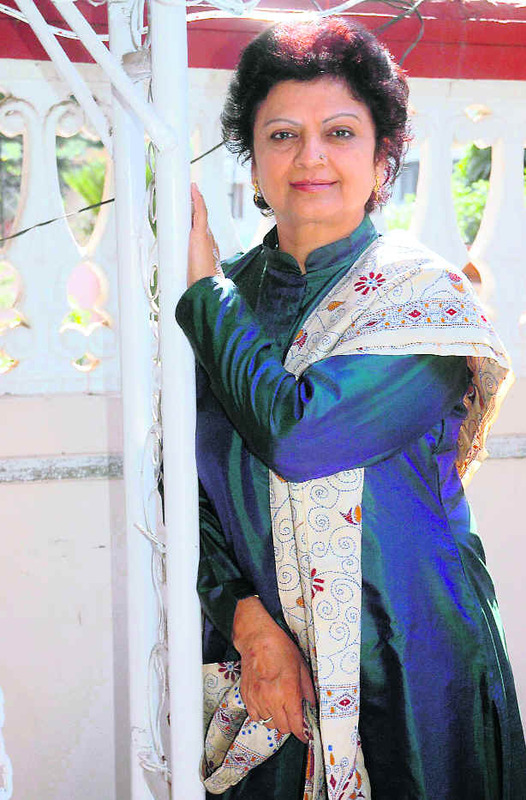 Bus wahin sey nachney ka chaska lag gaya," says Usha, who is also an acclaimed folk dancer, Kathak danseuse and heroine of the first silver jubilee Haryanvi film Chandrawal and many more produced by her poet husband Devi Shanker Prabhakar. She adds, "I learnt dance from Pandit Birju Maharaj, Kundan Lal Gangani and Maya Rao but acting in movies was never on my agenda. It so happened that my husband expressed a desire to make a Haryanvi film with me as the lead heroine. That's how Chandrawal was made. The movie became a silver jubilee. All the dance sequences were choreographed by me. We made a couple of movies after Chandrawal, but they didn't do that well." Now, it's time to hit the real world again. So, we ask what's keeping her busy these days and where does Haryanvi cinema stand now? "I am the president of the Haryana Arts Council, which works for the revival of Haryanvi culture, be it dance, music or theatre," says Usha, who is also the first Haryanvi woman dancer to perform on the national TV and at international venues. "About Haryanvi cinema, I would want to make Chandrawal 2 with Priety Zinta, or maybe some new genre of actors." All said and done, Usha Sharma opines that the government is doing whatever it can to bring Haryanvi culture into the mainstream. Nevertheless a Haryanvi television channel is the need of the hour, she feels, because, "Till the time we have a channel that promotes Haryanvi culture, we cannot do much. Also, we need to take our artistes to various world tours, so that people world over know what Haryanvi culture is all about." Mention Ayurveda and one immediately associates it with traditional therapies, never-ending treatments and tasteless medicines consisting of unpronounceable ingredients. It's now time to relate this alternate system of healing with medical tourism, miraculous treatments and Dr Ajayita Chanana. This is how. A city-based doctor of Ayurveda, who recently won an International Health Care Excellence Award showered by the International Business Productivity Forum. Post the achievement, she shares with Lifestyle, her experience and take, on the myths about Ayurveda. The award is in honour of her contribution to the medical field where she treated the 'given-up cases' by other doctors. A patient who was not just mentally but physically abnormal, unable to walk, showed 50 per cent improvement in just a few week's time. She says, "The patient was actually turned down by majority of the doctors but luckily I could cure him through non-surgical procedures." Critical medical cases being cured and that too through non-surgical procedures is actually music to anybody's ears. Does, Ayurveda remain under tapped and under-explored as a means of medicine? She rues, "You can say. The irony is that this system of medicine, which is exclusive to India and had its origins here, is more utilised by Europeans than us." She adds, "This can be our big export to the West and the medical tourism actually has more potential than any other industry." In times of global crisis, that is actually food for thought. The heroics of Prince Harry, third in the line of succession to the British throne, was revealed for the first time while battling Taliban in Afghanistan as he was made an honorary Gorkha while serving with the fearsome troops. Prince Charles and the Duchess of Cornwall met Gorkha soldiers in Brunei, and heard how Prince Harry had been made an honorary Gorkha when he served with the Nepalese fighters in Afghanistan, because he was "so liked". Harry, 24, earned the respect of the crack Nepalese warriors as he spent six of his 10 weeks on the frontline in Afghanistan bravely fighting alongside them. His comrades in lawless Helmand province - armed with their terrifying Kukri knives and famed for their killing skills - were so impressed they made him one of their own, The Sun reported. And to prove it they awarded the Household Cavalry lieutenant the greatest tribute they could bestow - one of their lethal daggers. 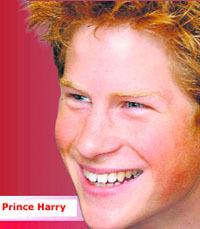 Harry's courage finally came to light yesterday after his dad Prince Charles paid a special visit to Gorkhas. Charles, who is Colonel in Chief of the Gorkhas, told Lance Corporal Bhim Garbuja, 25: "I am so proud that my son was able to serve with the Gorkhas, especially after all these years." He then joked: "I hear you were feeding him fiendish quantities of curried goat. He has a fantastic sense of humour." The soldier replied: "Yes. He liked our food - especially the curry." Captain Surya Gurung said Charles was right to feel proud and went on to give a heartfelt salute to his son at the garrison of the Royal Gurkha Rifles in Seria. "Harry was so liked by the soldiers. He is a good officer and he earned their respect in the field of battle," he revealed. Actress Ashley Olsen is reportedly planning a secret 1 million dollars wedding to actor beau Justin Bartha on the French Riviera. If sources are to be believed, the couple may tie the knot in the South of France next summer. According to the National Enquirer, 22-year-old Olsen's wedding party will include twin sister Mary-Kate, her 19-year-old sister Lizzie and half-sister Taylor, 12, while her two brothers are said to have been enlisted as groomsmen for the event. "Ashley has dreamed of having her wedding on the French Riviera, and she's going to ask her favourite designer, Karl Lagerfeld, to create a custom-designed gown," says she. "She also wants photographer Annie Leibovitz, who Mary-Kate has worked with, to capture the entire extravaganza on film," the source added. Olsen has been dating 30-year-old National Treasure star Bartha since the beginning of the year. Take That has made a record sell-out with its 600,000 tour tickets vanishing in just four-and-a-half hours. Becoming the fastest selling tour in UK history, the band's 2009 stadium tour, The Circus, has managed to displace Michael Jackson's record sales of Bad tour tickets in 1987. The tour tickets, which were put on sale at 9 am, were all sold by 1.30 pm - despite the added announcement of two extra shows at Wembley and Manchester. While many fans queued themselves in the cold to make sure they would see their favourite group perform, others crashed the Internet sites by flooding the cyberspace in want of the passes. A statement from the band said: "We are, once again, totally astounded by the response and amazed at being able to break such records. "We feel very privileged and promise to make it the best show we've ever done." Take That had received four nominations at the 2008 BRIT Awards taking home the Best Live Act and Best British Single trophies last year. After seeing sister Solange go through 'sweet' troubles while looking after her children, singer Beyonce Knowles says she has no plans of becoming a mum in the next three years. The Baby Boy singer had earlier claimed that the three things she'd like to cross off her wish list by the time she was 30 were - winning an Oscar, getting married and becoming a mum. However, now 27-year-old singer, who wed rapper Jay-Z in April this year, doesn't want to have kids at least for the next three years. "I'd still love to win an Oscar (but) the kids, I dunno," a website quoted her as saying. She added: "I've been keeping my nephew and he's the smartest little boy, but he's making it hard. It's a lot of work." However, she hasn't completely ruled out having kids before she turns 30: "In three years, maybe." Victoria Beckham has failed to land an immediate ruling in a lawsuit against a British publication - implying that the case is now set to go to trial. Earlier this year, Posh Spice had launched legal action against Grazia magazine, seeking damages for "hurt feelings and distress". The singer has accused publishers Bauer Consumer Media Ltd of invasion of privacy over an article published in April (08) which claimed she was unhappy about her soccer ace husband David's social life in Los Angeles. Victoria applied to the court for an immediate decision on the case; however, at a hearing in London on October 31, Justice Eady ruled it could not be settled without the arguments being presented in full. "It's selling copies on the back of what are claimed to be revelations about Victoria Beckham's private life and it is at that point that the law clearly draws a line." Bosses at Bauer Consumer Media deny invasion of privacy. A Dalhousie University mathematician has a mystery as to why the opening chord to The Beatles' A Hard Day's Night is completely different than anything found in the literature about the song to date. Jason Brown's work attains significance as no one quite knew exactly what chord Harrison was playing for 40 years. He has found that there was a piano among Harrison's 12-string Rickenbacker, John Lennon's six-string guitar and Paul McCartney's bass guitar, and that they collectively accounted for the problematic frequencies. According to him, it was George Martin, the Beatles producer, who added a piano chord that included an F note, which is impossible to play with the other notes on the guitar. Brown has revealed that he used a mathematical calculation known as Fourier transform to solve the Beatles' riddle, inspired by reading news coverage about the song's 40th anniversary.